Theirs is a partnership that is unique, a friendship of two brothers, the kind you would generally expect to exist in a storybook or television script. And on the Klamath River in Northern California they are known as the team who know how to get it….get the gold, that is. Not an easy reputation to obtain, and even a more difficult one to maintain. Gold is elusive, and keeping a partnership viable and working for more than one season means not only putting in long hours under water moving the overburden of rocks, sand, and gravel, it means having the ability to find the pay-streaks. 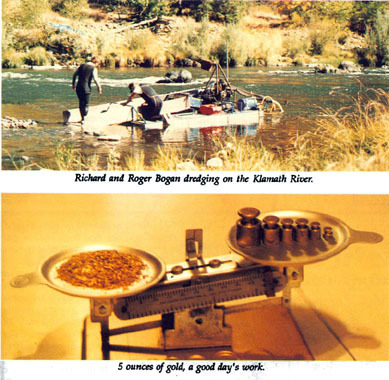 Their long time dream of putting an 8-inch underwater dredge to work became reality, and in a matter of approximately 31 hours of diving, the Bogan brothers netted $4,000 in placer gold from their very first clean-up. Sound easy? Well let’s take a closer look at all the hard work, preparation and planning that went into making this very demanding and difficult task actually work. In 1984 the Bogan brothers journeyed to Alaska for the summer, staying three months in the back country, 200 miles, from the nearest telephone in an area near Jack Wade Creek on the south fork of the 40 Mile. Throughout that summer Roger and Richard recovered enough gold to pay expenses they saw some magnificent country, and were mining only 1 1/2 miles from another hardworking miner who struck it rich with a 54-ounce gold nugget. After Alaska they decided to try California. “We’d heard rumors about rich rivers and they were true, but you have to really go for it. Even small dredges have the capability to actually bring up the gold, but it al1 depends on how hard a person wants to work. You just can’t sit on the bank and make that gold jump into your sluice box; you’ve got to work! The bigger the dredge the harder the work, but you get more production of course. “One thing about California, it’s a lot cheaper to mine there than Alaska, so we took a 4-inch, a 5-inch, and an 8-inch dredge with us all at the same time. We figured we could sample with the 5-inch, use the 4-inch in the creeks, and do the real production work with the 8-inch. 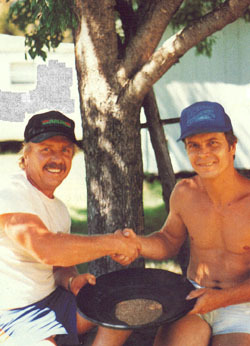 We spent about a month working the creeks, and that’s where we pulled our biggest nuggets — one was a really nice quarter-ouncer which Richard immediately laid claim to. We also found a lot of nice coarse gold.” In that first month the Bogans recovered 6 ounces, and then decided to move the “big guy” into the river.